Plasterboard doesn’t have to be boring. That idea has led Trim-Tex to design trims and beads that transform the interior of homes, offices and other projects into features. This drive to make “plain old plasterboard” into something exciting has cemented Trim-Tex’s position at the cutting edge of design. It has also led to the creation of their latest innovation – LED Light Bead. Trim-Tex LED Bead (72-LED10) allows you to incorporate energy efficient LED lighting into features that really deliver the “wow” factor. It’s the perfect accent for elevator lobbies, conference rooms and decorative soffits while providing a practical solution for safety strip lighting in projects like hospitals, nursing homes and theatres. LED Light Bead installs directly onto the plasterboard using “spray and staple” installation. It has a 27mm mud leg, 16mm return and features another, angled leg that allows an LED strip to be installed at the optimal light angle. This profile accommodates 10mm LED Strips. 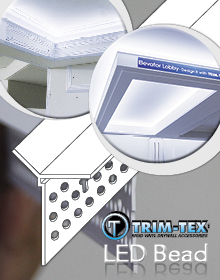 Trim-Tex LED Light Bead is available now from Wallboard Tools – LED strips are sold separately. Available now from Wallboard Tools. This entry was posted in New Products, Product Feature and tagged Australia, Feature, Plastering Beads, Plastering Trims, Trim-Tex. Decorative, Wallboard Tools. Bookmark the permalink.